Domaine la Roquete is owned by the Brunier family. Of course as you know, the Brunier family is most famous for owning course, Vieux Telegraph. The holdings of the family also include vineyards in the Gigondas appellation. Frederic and Daniel Brunier took over the vineyard after their father, Henri Brunier purchased the estate from Rene Laugier. The property takes its name from one of the lieux-dits where their vines are planted, Roquete. Henri Brunier bought the property and handed it over to his sons, Daniel and Frederic Brunier in 1986. The domaine is well placed in the center of the Chateauneuf du Pape village. They were able to hit the ground running as the first year the new owners produced wine was from the 1986 harvest. Until 2003, the property went under the name of Domaine de la Roquete. With the 2003 vintage, the owners simplified the name to Domaine la Roquete. The Domaine la Roquete vineyard is 30 hectares of vines located in the Chateauneuf du Pape appellation. 26.2 hectares are used for the red wine grape varieties. However, it is important to note that only 12 hectares are used to produce Piedlong, the red wine of la Roquete. The remaining vines are now placed in Vieux Telegramme. 3.8 hectares are used to plant grapes to make their white Chateauneuf du Pape wine. 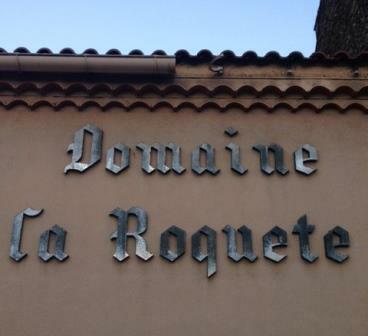 Domaine la Roquete produces 1 red, Chateauneuf du Pape wine and 1 Chateauneuf du Pape Blanc. This started following the 2011 vintage. Previously, the property produced 2 red wines, which you can see below. Those wines are no longer being made. The new wine, “Piedlong,” will be made from the oldest vines of Domaine la Roquete that come from their best terroirs. 90% of the wine is based on their old vine Grenache, planted on the Piedlong plateau. The remaining 10% of the wine is Mourvedre, which is planted in the Pignan lieu-dit. The remaining fruit from their vineyards that used to be placed in the wine of Domaine la Roquete is now used in the second wine of Vieux Telegraph, Vieux Telegramme. The new wine is called Piedlong. Domaine la Roquete Piedlong was first produced in the 2011 vintage. The wine has completely replaced both red wines from La Roquete, their regular Chateauneuf du Pape and l’Accent de la Roquete. Piedlong takes its name from the rock infused and stone covered soils where their best vines are placed, on the Plateau du Piedlong. The terroir is covered with rocks. Below the surface you find clay and sand soils. The wine is a blend of 90% old vine Grenache from vines that are at least 70 years of age and 10% old vine Mourvedre that is no less than 50 years old. To produce the wine, a portion of the grapes can be destemmed, but the percentage of destemming varies from vintage to vintage, depending on the ripeness of the stems and the thickness of the skins. Piedlong is vinified in a combination of wood and concrete tanks. Malolactic fermentation takes place in vat. The wine is aged in foudres for about 2 years before bottling. On average, the production is slightly less than 3,000 cases per vintage. Domaine la Roquete Blanc Clos la Roquete is made from a blend of 35% Clairette, 30% Grenache Blanc, 25% Roussanne and 10% Bourboulenc. The vines were planted in 1987. The production is slightly more than 800 cases per year. Domaine la Roquete can be enjoyed on the young side. Young vintages can be popped and poured, or decanted for between 1-2 hours. This allows the wine to soften and open its perfume. Older vintages might need very little decanting, just enough to remove the sediment. Domaine la Roquete is usually better with 4-6 years of bottle age. Of course that can vary slightly, depending on the vintage. In the best vintages the wine should be consumed within 4-15 years after the vintage. Domaine la Roquete is best served at 15.5 degrees Celsius, 60 degrees Fahrenheit. The cool, almost cellar temperature gives the wine more freshness and lift. Domaine la Roquete is best served with all types of classic meat dishes, veal, pork, beef, lamb, duck, game, roast chicken, roasted, braised, stewed dishes, sausage, barbecue, grilled meats, and cassoulet. Domaine la Roquete is also good with Asian dishes, hearty fish courses like tuna, mushrooms, cheese, pasta, eggplant and tomatoes. The white wine of Domaine la Roquete is best served with a myriad of different seafood dishes, shellfish, crab, lobster, sushi, sashimi, chicken, pork and veal, as well as Asian cuisine. The following red wines are no longer produced at Domaine la Roquete. Domaine la Roquete Chateauneuf du Pape is made from a blend of 70% Grenache, 20% Syrah and 10% Mourvedre. Like any estates, the vines are planted in different vineyards. They have grapes that come from Colombis, Pignan, Les Pialons and of course Roquete. The traditionally made wine is aged first in vats for 10 months before its moved to old foudres for an additional 10 to 12 months prior to bottling. The average production is close to 6,000 cases of wine per vintage. The wine is no longer being produced. Domaine la Roquete l’Accent de la Roquete made its debut with the 2004 vintage. The wine is produced by blending 90% old vine Grenache from vines that are at least 60-years of age with 10% Mourvedre. The wine is aged in foudres for between 18 and 24 months. The production is close to 350 cases per year. The wine is no longer being produced. Daniel and Frederic Brunier also own 3 hectares of vines in the Cotes du Rhone appellation, 7 additional hectares of vineyards in the Ventoux and 3 additional hectares of vines. Light in color, soft, refined and fresh, this is a delicate, feminine, forward styled wine that will be best tasted young for maximum enjoyment of all its spicy, fresh cherries and strawberry notes. The wine was made using a blend of 90% Grenache with 10% Mourvedre. This pleasant, medium bodied, charming easy drinker will deliver fresh, ripe, uncomplicated, red fruits without any effort. Traditionally styled, the nose was lightly more interesting than the palate. My first and last time tasting this wine, because it's no longer being produced as of the 2011 vintage. I really liked its rich, ripe fruits, round, fleshy texture and the fresh, sweet, black raspberries, kirsch and pepper in the attractive finish. Elegant, fresh, medium bodied, finesse style of Chateauneuf, with a fresh, soft, floral, sweet, cherry and raspberry character.